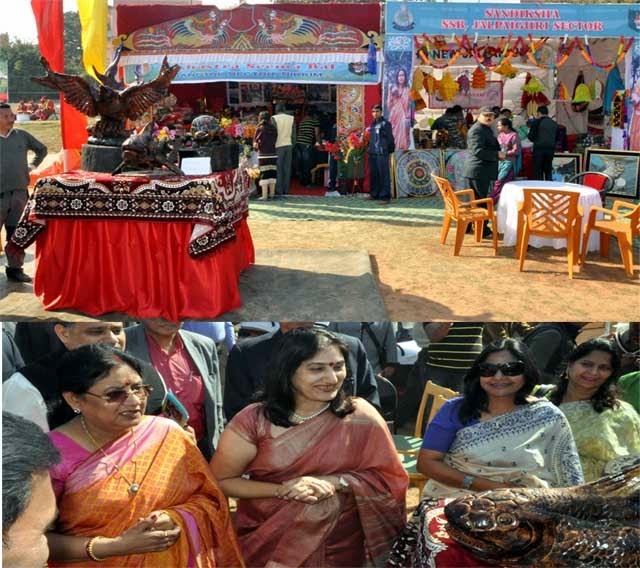 Siliguri Frontier Exhibition Stalls attracted huge crowds to the Sashastra Seema Bal Wives Welfare Association (SWWA) Exhibition inaugurated by Smt Savitri Singh w/o of Shri Rajnath Singh Union Minister for Home Affairs in New Delhi on 13 Feb 15 at Old JNU Campus. Smt Kiran Sharma President, Central Committee of SWWA and w/o Shri B D Sharma Director General, SSB briefed the guests about the extensive work being done by the SWWA in different states including, work in providing free of cost Cleft Lip and Cleft Palate repairs in association with Smile Train International along the INB and IBB and the adoption of the Sarvodaya Kanya Vidyalaya School in New Delhi. 42 stalls representing five Frontiers of SSB, Training Centres and SWWA Hqrs Stall have been established. These stalls comprise the exclusive grains, provisions, and fancy products of the states of J&K, Madhya Pradesh, Gujarat, Uttaranchal, Uttar Pradesh, Bihar, West Bengal, Assam and Arunachal Pradesh. In all, four stalls were set up by the Siliguri Frontier. One stall each has been established by Ranidanga, Jalpaiguri and Gangtok Sector Headquarters. These stalls sold the best of goods produced by the Wives of SSB personnel and some of the exclusive products from the region. One Food Stall was also established to serve the exquisite cuisines of West Bengal and Sikkim. Rolls, Machli jhal bhaat and other popular items were in great demand here. SSB personnel are also presenting the cultural art forms in the programme i.e., Bhutia, Nepali, Nagpuri and Nepali film Dance. However, the main attraction of the SWWA Exhibition was the life size drift wood sculpture of an eagle that resembles the Eagle in the formation sign of the Force. The three prominent craft including, a life like fish and tortoise woodcraft were created by HC/GD Shri S Ranjit Singh (a Manipur State Award Winner) with assistance from HC/GD TH Sailendra Singh of Siliguri Frontier for the exhibition in 15 days time at SSB Training Centre Ranidanga.